They are among the most highly trained people on Earth, working with some of the most complex machinery ever invented. But astronauts and cosmonauts are only human, and sometimes—whether through faulty equipment, operator error, or just plain bad luck—things can go awry in space. Although almost every U.S. and Russian space mission over the past half-century has been successful, a few are remembered for what didn’t go right. The world’s first spacewalk, for example, nearly ended in tragedy. On March 18, 1965, Alexei Leonov (pictured above) spent just over 12 minutes outside his spacecraft, connected to it by a 17-foot-long tether. When he tried to come back in, he found that his spacesuit had overinflated, and he was unable to fit through his capsule’s airlock. Finally, Leonov opened a valve that released some of the pressure, and was able (barely) to get back inside. See the gallery below for more space goofs. Mir commander Vasily Tsibliyev was docking a Progress cargo ship by remote control in June 1997 when he lost sight of the unmanned spacecraft and it careened into the Russian space station. 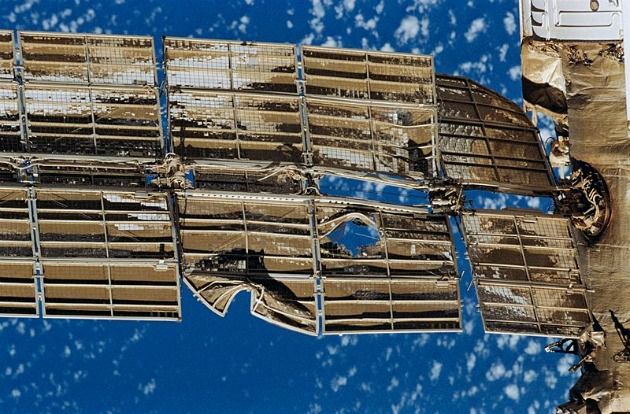 The Progress damaged a solar panel (pictured) and punched a hole in the Spektr science module, causing the first depressurization in space. Flight engineer Aleksandr Lazutkin and NASA astronaut Michael Foale quickly sealed off Spektr and kept the station from having to be abandoned.